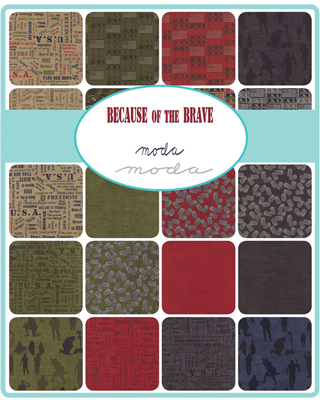 Moda is proud to introduce a line of fabrics, Because of the Brave inspired by Tom and Stephanie Hove. Stephanie is a second generation salesperson for United Notions/Moda Fabrics and we have asked her to tell us a little bit about the inspiration behind this fabric line. Having a soldier deployed, I encountered feelings that were very unfamiliar to me. As I went on with my regular life, it was hard not to catch myself thinking about where he was and what he was doing all the time. I was afraid, was he? So many questions and thoughts were running through my head. Of course, the imagination is often worse than real life, but sometime it isn’t. I am one of the lucky ones. My soldier came home to me in one piece. While he was gone, I did not have pets or small children that needed to be taken care of. I have a job that keeps me very busy and creatively stimulated. I got, what I like to refer to as, “The Year of Stephanie”. I had to maintain the house on my own, which could be trying. Time seemed to be completely stopped and the days and nights took FOR-EV-ER to pass. Yes, I was still able to go out and have fun and laugh with my friends, but nobody tells you about the loneliness. Nobody tells you about the constant fear every single time your doorbell rings or a phone number comes up on your caller ID that you don’t recognize. Quilting and sewing became much more than a hobby, it became an escape. Now, think about all the military families who have to work, take care of kids, and maintain a household by themselves for MONTHS at a time. Going through our busy lives, it’s easy to ignore what someone in our community might be going through. I often would be out and about, running errands, wondering if anyone around me realized the gift that our service men and women give us: a “normal” life which we all take for granted? Because I don’t live on a base, there are not many people who “get” what it is like to be married to a military man. We all know about war since it is reported on the news multiple times a day–almost to the point where you are numb about anything you hear–but until you send off your loved one to one of those far off places that you hear about everyday, I don’t think it is possible to even truly comprehend it. And no, it’s not anything like your husband who is away on a “business trip”. (Honestly, this came up as a comment…more than once!) Luckily, I had a couple of girlfriends who are married to Marines who have deployed. I was able to turn to them for advice. 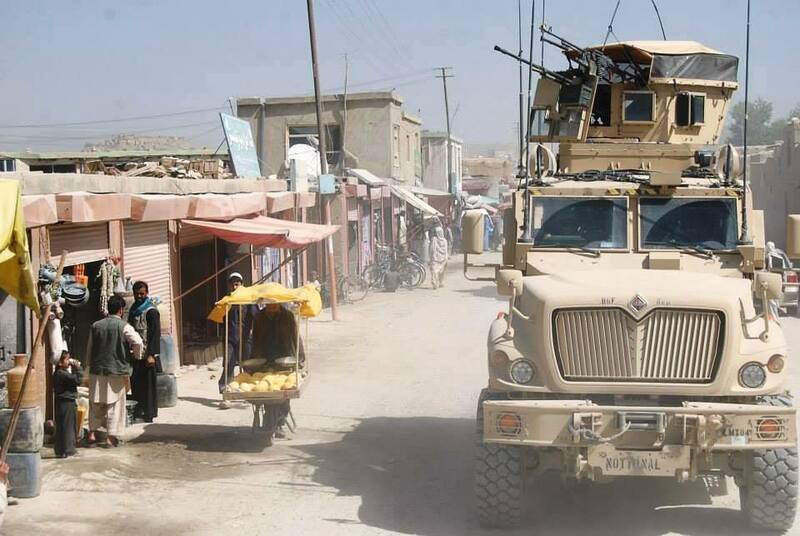 Is there anyone in your community that has a service member deployed? Is there anything you, personally, can do for them? Sometimes it’s as simple as saying Thank You for your service. If you are close to them, maybe it’s offering to mow their lawn or watch their kids for an hour so they can grocery shop. Just recognizing their sacrifice is something we could all work a little bit harder at, myself included. It’s very easy to live our lives and go about our day, but maybe stop and take a minute to check in with a family that has an entirely different perspective on living life. 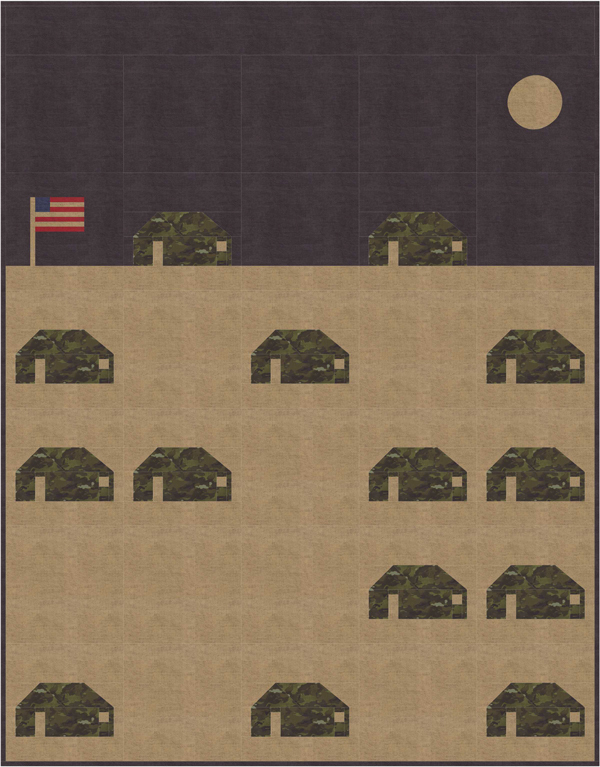 Being a quilter with a soldier deployed, of course I was always looking for fabrics to get a quilt together for him. I just couldn’t find what I was looking for. I wanted something rustic and manly. Rich colors and texture. Military looking- without being novelty. It just didn’t exist. With his help, we designed what we think is a line that touches on all of that and more. We wanted the colors to be deep and true. When reading the words, we wanted people to think and remember the sacrifices. The camouflage print and flag patches bring authenticity. The silhouettes, hopefully, evoke emotions of pride. We really are The Home of the Free BECAUSE of the BRAVE! In conjunction with Because of Brave fabrics, Moda Fabrics is introducing Piece and Comfort Challenge to recognize and honor the sacrifices that are made by our country’s military families. Including a charity was also very important to us. We wanted to find one that really focused on and recognized the military families as much as the service men and women. USA Cares is just that. 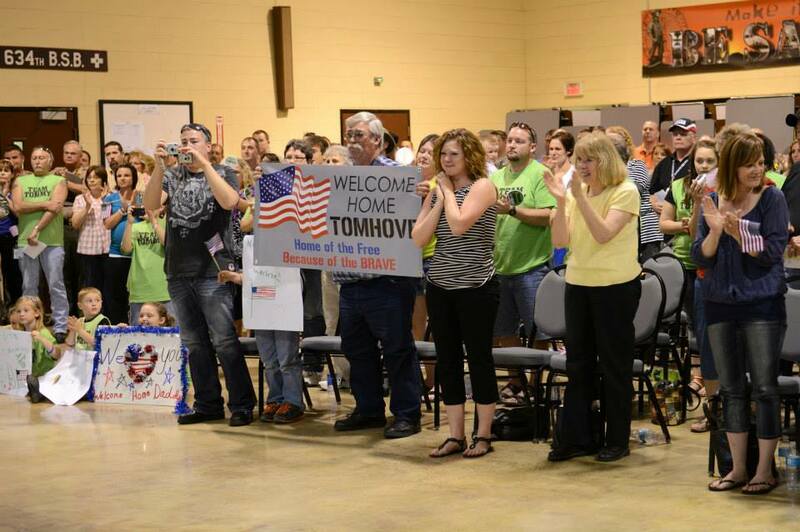 Proceeds from ‘Because of The Brave’ fabric line will benefit this incredible organization. – Removing the financial barriers that prevent veterans from receiving treatment for Post-Traumatic Stress Disorder and Traumatic Brain Injury. – Removing the financial barriers that prevent veterans from Securing employment. USA Cares has responded to over 50,000 requests for assistance with over $11 million in indirect-support grants. Thank you for your support of the military and their families. 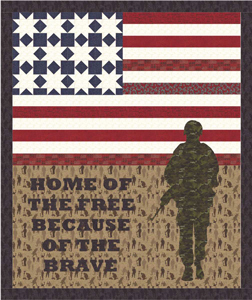 -Purchase fabric from ‘Because of The Brave’ by Moda or ‘Red, White & Free’ by Sandy Gervais. -Make a quilt using at least 90% Moda fabrics (50% must be from one of the two above lines). You can use an existing pattern or create your own. 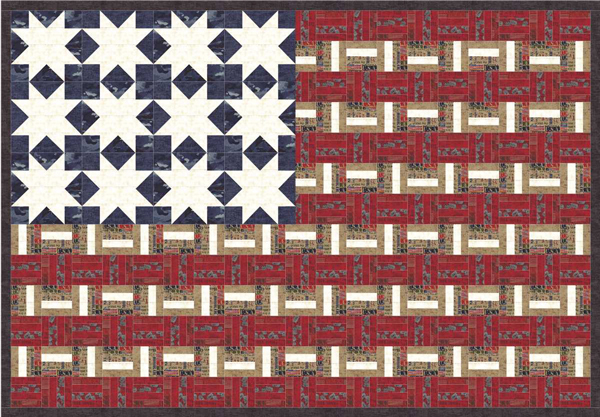 -Completed Challenge Quilts will be displayed at participating shops April 6-18. Customers will vote for their favorite quilt. -The digital image of the winning quilt in each shop is submitted to a National On-line quilt show held by Moda. Winner announced May 8, 2015. – Shops must register to be included on the Piece and Comfort Challenge list. To do so, click here for SHOP REGISTRATION FORM. Are there any military families in your area? What is their story? Maybe you could find a way to help them out on a local level. You never know how much a simple gesture of Thank You could mean. We hope you all enjoy the ‘Because of The Brave’ fabric line as much as we do. Thank you in advance for your support…and for those of you that have served, or are serving (including the families)…THANK YOU FOR YOUR SERVICE! To see the complete collection, click here.